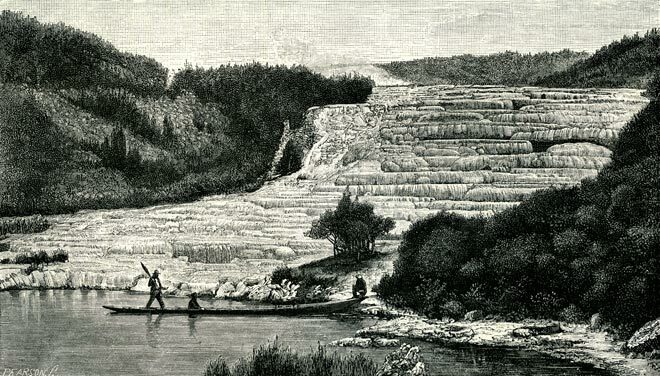 This image of the Pink Terrace, near Rotorua, was used in James Froude's book Oceana. Froude was a well-known English historian who set out to explore the colonies of the British Empire. He spent a month in New Zealand in March 1885 and, although only visiting the North Island, was enthusiastic about its potential as the future base of the empire in the southern hemisphere. Like many travellers, Froude wrote lyrically about the Pink and White Terraces, which by the time he visited had become a major international drawcard. The next year the terraces were destroyed or submerged in the Mt Tarawera eruption. Oceana became the best-known traveller's account of 19th-century New Zealand. Reference: James Anthony Froude, Oceana, or, England and her colonies. London: Longmans, Green, 1886.